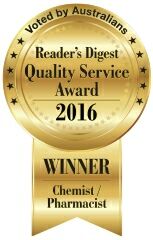 In April 2016, for a second year running, Amcal won the 2016 Readers Digest Quality Service Award. This award was determined through a survey of Australians and recognises customer service satisfaction and excellence throughout the Amcal brand. Amcal Pharmacy has won the prestigious Canstar Blue Most Satisfied Customers Award - Pharmacy for 2014, ahead of other well-known pharmacy brands. Amcal achieved the highest five star rating in five categories including overall customer satisfaction, service satisfaction, availability, availability of health management programs, and the provision of advice. "It is great for Amcal to win the Canstar Blue most satisfied customers award, they are obviously meeting the needs of their customers," said Megan Doyle, Canstar Blue Business Unit Leader & Group Strategy Manager. The Canstar Blue Most Satisfied Award surveys an ongoing panel of 2,500 consumers across a range of satisfaction and service excellence criteria. 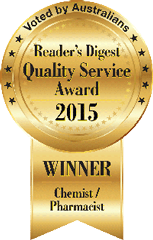 2011 – Amcal Pharmacy was the proud winner of the inaugural Roy Morgan Research's Customer Satisfaction Award for Pharmacy, ahead of other leading Australian brands. Michele Levine, CEO of Roy Morgan Research, said at the time and something she's reinforced since, that winners of the prestigious award are "the leaders in their fields in terms of satisfying their customers, and that the importance of that is only increasing (today). These awards are based on proven, trusted data". The Roy Morgan Research customer satisfaction ratings are collected from Roy Morgan's 'Single Source' survey of approximately 50,000 Australian consumers annually - the world's largest ongoing single source survey.